Given the case that is building against Donald Trump, I tend to agree with Martin that it is not an impeachable offense to pay off mistresses to buy their silence. To date, that is the only publicly available testimony we’ve gotten from Michael Cohen in relation to the president’s criminal activities. When Trump’s lawyer first started leaking things to the press, it was the audio tape of a discussion about managing a payment to Karen McDougal to buy her silence. Soon after that came reports that Cohen could testify that the president knew about the Trump Tower meeting in advance. They’re still hinting that is the case, but Lanny Davis (Cohen’s lawyer) is being very careful about what he’s saying. O’DONNELL: Last night you said that your client, Michael Cohen, has evidence about a conspiracy to collude and corrupt the democracy system in the 2016 election including computer crime hacking. When will you speak with the special counsel about this? DAVIS: I was a little careful in the way I phrased that. 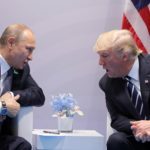 I said that he had matters that would be of interest to the special counsel relating to preknowledge of computer hacking by Donald Trump, which if true, if true would constitute knowledge of a crime committed by a foreign government in hacking our computers, which was part of the indictment of 12 Russians that the special counsel has already published. So my observation is that he can speak to that. Beyond that I can’t go — it will have to play out with the special counsel. O’DONNELL: You’re saying Cohen knew that the president of the United States knew about hacking during the campaign? DAVIS: I can’t go beyond saying that it’s my observation that this topic will be of interest to the special counsel. He has statements that he can make along those lines, but I can’t go beyond that. Michael Cohen told lawmakers last year, in sworn testimony, that he didn’t know whether then-candidate Donald Trump had foreknowledge of the 2016 Trump Tower meeting with Russians, three sources with knowledge of Cohen’s testimony tell Axios…And Cohen still doesn’t know whether Trump knew about the infamous meeting, according to Cohen’s lawyer, Lanny Davis. “Nothing has changed,” he told Axios. From the beginning, Cohen has maintained that he has never in his life traveled to Prague. According to David Corn, he actually admitted in a private conversation that wasn’t true. 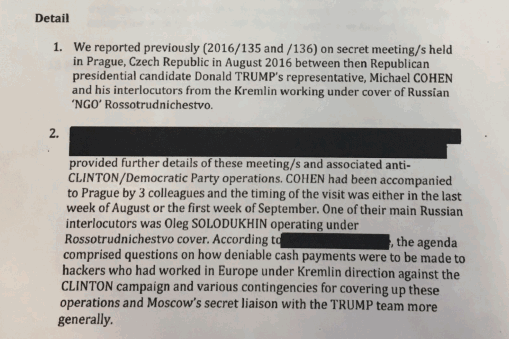 Then back in April, McClatchy reported that special counsel Mueller had evidence that Cohen had been in Prague during the time noted in the Steele dossier. While no other news source has confirmed that claim, it would seem that if Cohen wanted to give federal prosecutors the whole truth and nothing but the truth, he’d come clean on this one. But according to Lanny Davis, that is clearly not happening. Ever since Cohen started leaking information to the press about his former boss, I’ve been skeptical about what he’s up to. Giuliani wasn’t wrong when he said that the president’s former lawyer is a pathological liar. We have no way of knowing what information he has/hasn’t been willing to give to federal prosecutors or the special counsel. But when it comes to actually confirming a conspiracy between the Trump campaign and the Russians, it sure looks to me like he hasn’t even come close to being honest yet.